Maps capture our attention in a way that words never will. 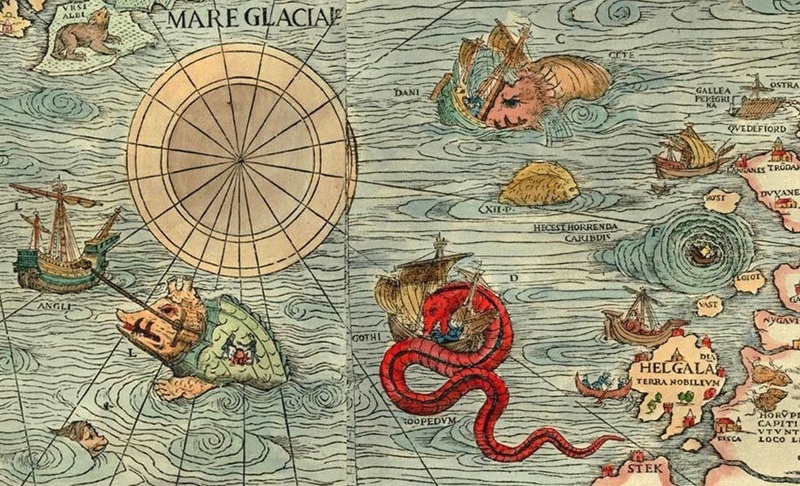 Before Columbus, sea monsters drew our eyes away from rough inaccurate shorelines. 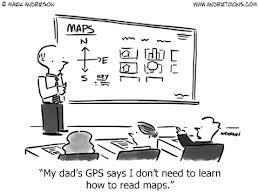 Excitement over map reading in the automotive age doubtless caused an increase in divorce rates. Now, maps face competition from the Voice on your GPS. I wonder what the Voice will do for marital harmony. In business discussions, maps often play a significant role. They can help with where you are. They can help with where to go. One example is Value Maps. In the 90’s, Bradley Gale led the way in highlighting the relationship between Quality and Customer Value Management (see Managing Customer Value, The Free Press, 1994). In his value maps, graphical relationships between perceived relative quality and relative price help business teams understand the positioning of their products and their prices relative to the competition. McKinsey and other consulting firms have deployed value maps, sometimes in a different form, with absolute instead of relative perceived customer price and perceived customer benefits, but generally with similar visuals, applications and objectives. • Identify the factors or quality attributes, other than price, that are important to customer purchasing decisions. • Determine weights for the quality attributes that add up to 100%. • Determine a numerical score or performance measure for each of the quality attributes for each competitor. Each competing product is then a point on a two dimensional graph with a weighted performance measure or value score on the x-axis and a price measure (whether perceived or actual price) on the y-axis. Down and to the right of a fair-value or value equivalence line are the competitive alternatives with a value advantage that are likely to gain market share. A value map provides a clear graphical display that includes a number of competitors. It provides perspective on competitive positioning in terms of value and price and is used to help teams plan or rethink their offering, their messaging and their pricing. Disciplined, rigorous value mapping processes gather customer data for value mapping using good questionnaire and survey methods. But more than a few marketing teams have been known to meet in a windowless room and start naming, scoring and weighting quality attributes for a value map without the benefit (or cost) of customer input. A Value Map is only as good as the alignment between numerical inputs and representative customers’ perceptions. For B2B companies, Value Maps derived this way stand in distinction to several methods for quantifying and communicating the dollar value of a product to a customer based on the customer’s economics. These customer economic approaches, including TCO, ROI and EVE, all seek to quantify objectively measurable economic impacts of choosing a product and are all designed to be deployed in effective value propositions. If you are careful in how you use them, these other methods all get to the same answer, although there are differences in emphasis and practice, resulting in strengths and challenges of each. Thinking in terms of customer math, some first principles and some sound practices can be a useful reference point for comparison between these methods. Like economic methods for value quantification, Value Maps make little sense when your product is not differentiated from its competitors. Value Maps, derived in the usual way based on numerical performance scores, are not necessarily consistent with the results of an economic or mathematical analysis of a product’s impact on a customer’s business. • As a first step toward quantifying customer economics. Some product teams start with limited understanding of their customer’s business. Some product teams need a starting point to think about their product’s impact on their customer’s business. Value Maps are one place to start either or both of these discussions. Whether or not customers are surveyed or interviewed, a Value Map is a tool that can help product teams generate hypotheses about key elements of product differentiation, their potential importance and their economic value. There are other approaches to framing a team’s discussion of customer economics, for example by qualitatively listing differentiated features and attributes of an offering, and then linking them to qualitative (or quantitative) customer benefits and sources of quantified customer value. But a Value Map provides an instant visual. A visual that is only as good as its scores and weights. A visual that is preliminary and is designed to be refined or replaced. But a visual place to start. • When quantifying customer math is difficult or not worth it. An investment in understanding customers and their economics takes time and effort. The investment is often modest when a team can access pre-existing organizational customer knowledge or relationships that it leverages to understand how a product impacts customer profitability. The investment required is sometimes greater in understanding the economics of a new customer base or in understanding value created that is remote from the day job of normal customer contacts. When a business’ primary contact is an operating manager, it is often easier to get quality feedback about the benefits of a product in reducing labor costs or increasing factory efficiencies than it is to get an understanding of how a product increases revenues or reduces financial risks. Sometimes teams don’t have the skills or resources to make this investment. Sometimes the payoff of making this investment is limited, for example when a product is relatively unimportant to a business’ growth or revenue. In these circumstances, Value Maps may be good enough for the purposes at hand. • When customer decision-making is not based primarily on quantifiable economic factors. Business decision-making, as taught in B-schools, is quantitative and subject to quantitative argument. But some decision-makers may be less rational, may have non-economic objectives or may not be aligned with their business’ profitability objectives. Some businesses may not be subject to financial discipline. Customer intuition, psychology and perceptions may be more important than the quantified impact of a product on a customer’s profitability. The agency problem, behavioral economics, psychology and Kahneman & Tversky are all useful in understanding business decision-making. When businesses don’t do the math or when business customers don’t make rational, quantitatively influenced decisions, Value Maps can provide an alternative perspective on B2B product positioning. Quantitative methods for customer economics, including EVE, have alternative approaches to including unquantified or unquantifiable factors in their analysis. 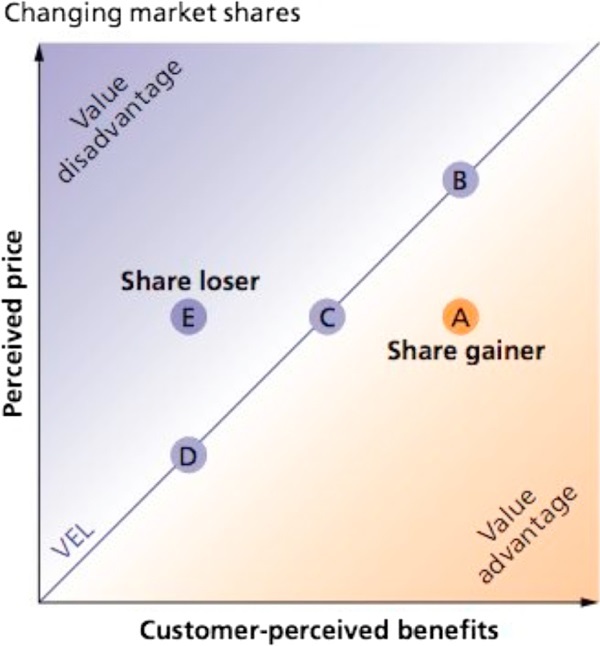 Although some practitioners of EVE would say that they never met a source of product differentiation they couldn’t quantify, EVE price setting often incorporates intangible or unquantified “pricing sensitivity factors” in considering how much of a product’s quantified differentiated value a company should attempt to capture in its price. • As a way to display quantified customer math for different alternatives. Although it is not the usual way to derive a Value Map, quantified customer economics, coming from either an EVE analysis or a TCO analysis, can be displayed in a Value Map. The weighted performance score on the x-axis of the usual Value Map can be replaced with a dollar-quantified absolute or relative value or cost. As the socialist planners taught us in the last century, dollar weights based on prices are not the worst approach to making rational decisions. In graphing EVE analyses in a Value Map a few choices need to be made. An EVE analysis of two alternatives provides a natural measure of value: Total Economic Value (in EVE, the sum of Competitor Price and Differentiation Value). But it is only a value measure for one of the alternatives. Unlike TCO, EVE is comparative; EVE value drivers are expressed as value differences between products, not as totals for a single product. When multiple alternatives are being compared in one or more value models (n alternatives can be consistently compared in n-1 EVE models), there is always at least one alternative for which there is no explicit or implicit number for economic value. It is natural to make this the alternative that is on the 45 degree “Fair Value” line, where its price is equal to its value. It is also natural to choose the lowest value alternative as the point to plot on the 45 degree line. When one alternative is doing nothing or the status quo (with a zero price) it is natural to assign this alternative a zero value and make it the origin in the 2-dimensional graph. Math and graphics will do the rest. • Value Maps may provide an inaccurate and incomplete B2B picture. Value Maps derived in the usual way are unlikely to be consistent with the results of an economic and mathematical analysis of a product’s impact on a customer’s business. TCO, ROI and EVE in practice all take the next step of quantifying differentiation and measuring in dollars (or euros) the economics of competing alternatives. For any of these economic methods, the numerical comparisons and the weighting of factors considered in making a decision are different from the performance scoring system used in deriving a typical Value Map. Obtaining the same results using both approaches would be an accident. Making the same decisions using both tools would be a random outcome. A high quality economic approach provides a better understanding of a B2B customer’s rational decision-making. • Value Maps have limited utility in Value Communication. There is a real and tangible difference in B2B communication of value propositions to customers between Value Maps and economic approaches. Imagine a sales rep defending a Value Map score of 4 that his team, or another customer, has placed on a specific product attribute. Imagine a sales rep arguing why a weight of 15% on a Product Reliability attribute makes sense to a customer relative to a 25% weight on a Labor Efficiency attribute. Adding up dollars is something a customer understands. Adding up weighted scores is a foreign language. • Fair value lines can be misleading. The word “fairness” resonates in philosophical discussions but it has its limits in the marketplace. In Value Maps, the fair value line is supposed to be about balancing value with price. Fair value based on a scoring system is a strange notion when the impact of a product on customer economics can be quantified in dollars. Gerald Smith and Tom Nagle (see Marketing Management, May/June 2005 and July/August 2005) make a persuasive case that moving along the fair value line, as conventionally derived using performance scores, results in a downward pricing bias for differentiated products. They urge that B2B companies determine real economic differential value and price accordingly. If, instead of basing a value map on scoring, a value map is derived from EVE outcomes (as described above), the meaning of the fair value line is completely different. In this case, moving along a 45-degree fair value line relative to a competitor would mean that a product team would be trying to capture 100% of the incremental value generated by their product in the price they set. This is unlikely to create persuasive value propositions. In sum, Value Maps are a useful framework in B2C and a useful tool in B2B. They can help B2B product teams move forward in understanding their customers better. But B2B teams who stop with Value Maps miss an opportunity. An opportunity to understand customers better. An opportunity to communicate differentiation more effectively. By understanding and communicating customer math. 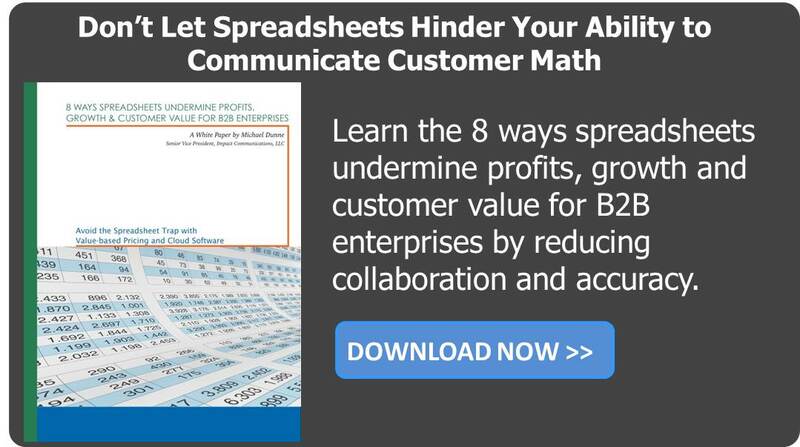 Organizations looking to make customer math central to their approach to product management, marketing and sales almost always start with spreadsheets. But dueling spreadsheets can cause confusion. Spreadsheets don’t usually provide a common framework. They don’t embed the disciplines that avoid mistakes. They don’t build fluency in a common language understandable by the customer. A scalable cloud platform drives good decisions and effective, tailored customer value propositions that highlight differentiation, enhance decision-making and improve value capture. Peyton Marshall is CEO of LeveragePoint. Previously, he served as CFO and Acting CEO at Panacos Pharmaceuticals, Inc., CFO of EPIX Pharmaceuticals, Inc. and as CFO of The Medicines Company through their initial public offering and the commercial launch of Angiomax®. Previously, he was an investment banker in London at Union Bank of Switzerland, and at Goldman Sachs where he was head of European product development. He has served on the faculty in the Economics Department at Vanderbilt University. Dr. Marshall holds an AB in Economics from Davidson College and a PhD in Economics from the Massachusetts Institute of Technology.